Men's basketball shorts from Tommy Jeans. 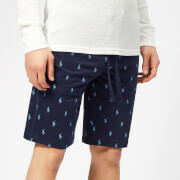 Crafted from heavy cotton terry fabric, the shorts cut a relaxed fit with a slightly longer length. Detailed with a drawstring waist, side seam pockets and printed branding to the leg. A Tommy Hilfiger embroidered flag logo features at the hip. Complete with a decorative rear welt pocket.